You can play Dark Woods 2 on this website so you don't need to download and install the game on your computer. We recommend to use Google Chrome when playing DOS games online. NOTE: This game can be played in Windows using a third-party port. dw2edit.zip is a map editor for the game. Dw2pack.zip contains 100 user maps for the game. 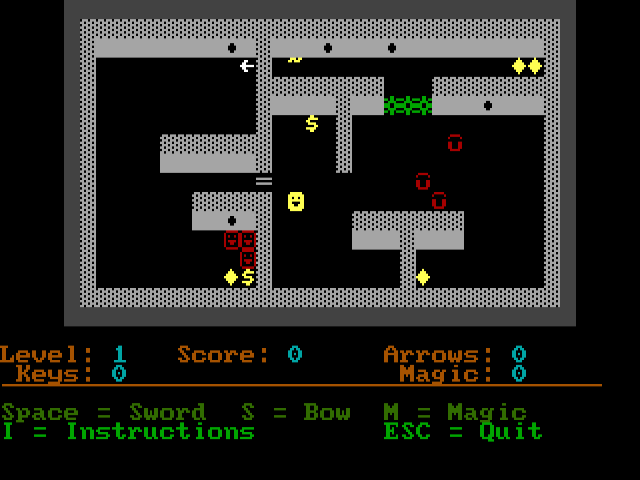 The sequel to my ascii based graphic adventure game, called Dark Woods 1. Dark Woods 2 takes by where the last game ended, inside the Castle ruins. You, Eduin, the fearless adventurer must find your old village in order to win the game. Dark Woods 2 features 11 maps and the option to make/play custom maps. The score system is also fixed.